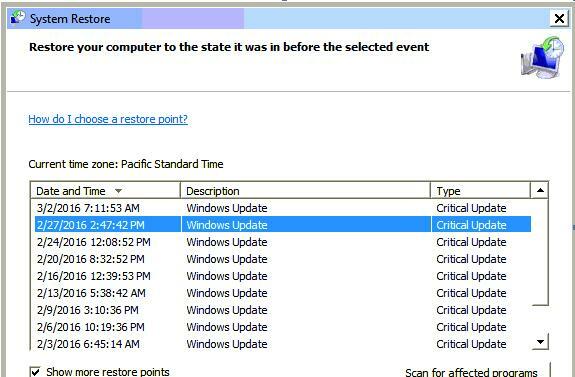 In March 1st, 2016 Microsoft released a Critical windows update for Windows 7 under KB2952664 which appears to corrupt something in computers with 4 port video cards or the drivers for them. The reason is not yet known but we will assume that at some point Microsoft will acknowledge and fix it. For now we have our own fix for this problem which is shown below. First, if you have more than 2 displays in your system disconnect all but 1 or 2 monitors from the back of the video card temporarily or you will not be able to get into Windows. 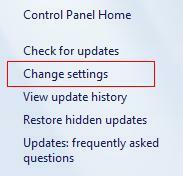 Once you are back into Windows, the next step is to turn OFF automatic windows updates, for now anyway. Click on the dropdown box and choose NEVER Check for updates, for now. You can always manually check for updates at any time. But if automatic updates are turned on, it will download this corrupted update and you will be right back were you started. Turn Off for now so it looks like this below. Note to UN check all of the boxes underneath it as well. Choose a restore point BEFORE March 1, 2016 and proceed through to complete this process. It will automatically reboot afterward. Note this does not change anything with your personal data. It is merely reverting the Windows operating system to an earlier point in time when things worked correctly. Once the reboot is successful, plug the rest of your monitors back into to 4 port card(s) if that is your case, and your displays should be restored at this point. By default, Microsoft sets the home page of Internet Explorer to a Microsoft site. That said, the prompt for Windows 10 is annoyingly embedded. To fix that, simply change your default home page to anything OTHER than Microsoft, Google.com for example. To do that, RIGHT click on the top of IE and make sure your Menubar is showing. Then under the Tools menu, all the way at the bottom click on Internet Options. Erase the default URL and type in www.google.com to reset your home page.